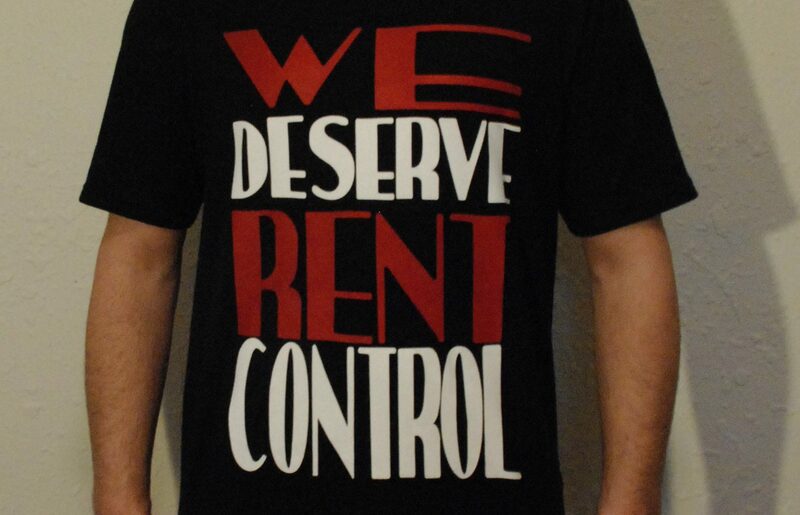 Wear your support for an open dialogue on RENT CONTROL in Washington State. Proceeds from sales of these t-shirts go to support Sawhorse Revolution. Check out the link and learn about the wonderful programs they foster benefiting youth and the homeless in our region. T-shirts available in Small, Medium, Large and Extra Large. 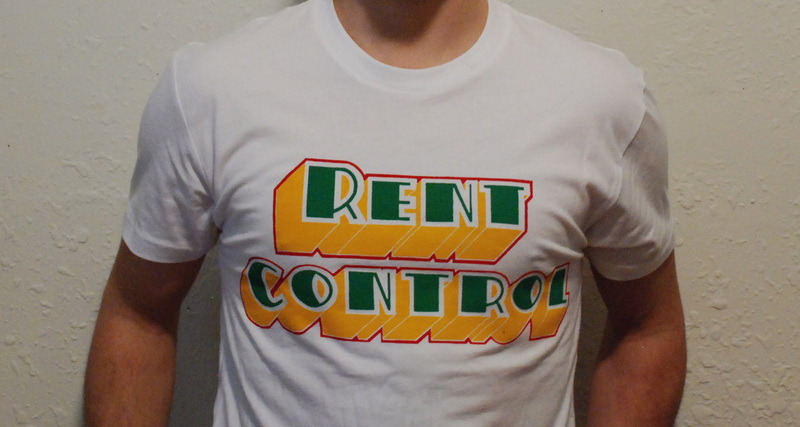 Two color WE DESERVE RENT CONTROL silkscreen (black t-shirt) and three color RENT CONTROL silkscreen (white t-shirt). Both designs are printed on a soft cotton shirt, currently only available in colors shown. Price is $35 including shipping, or $30 if shipping is not required. Payment can happen through PayPal, Venmo or cash if meeting in person. Exclusive! September 27-October 27. You can purchase these two t-shirt designs at SPACE Gallery, located in Magnuson Park. 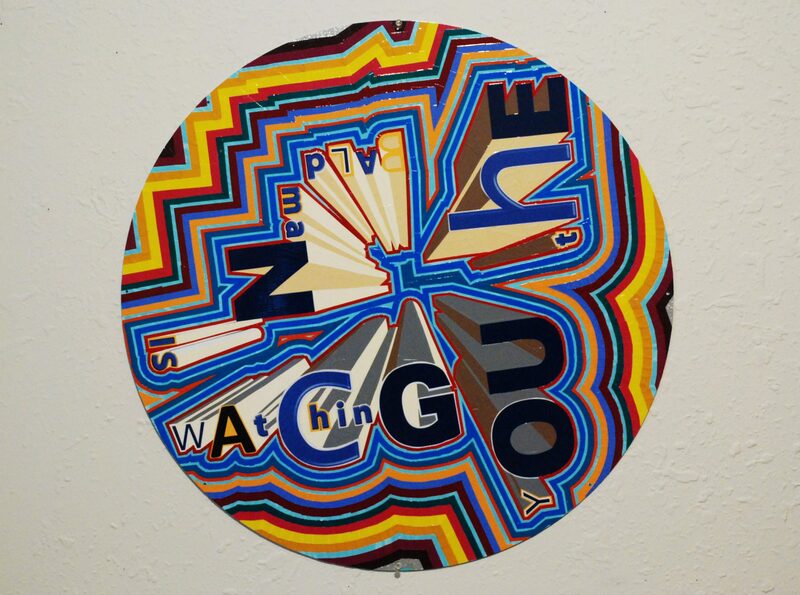 For the duration of Redlined, a group show of political/socially conscience art. Drifting between streets and vacant lots, not far in our past is the ghost of a rainforest lush with wet green vegetation. Interacting with this regions change as it claims memories from around you is a constant effort to recall what was. This mural was painted as a memorial, remembering time, effort and thought. As space transforms it must be recognised, appreciated and honored. 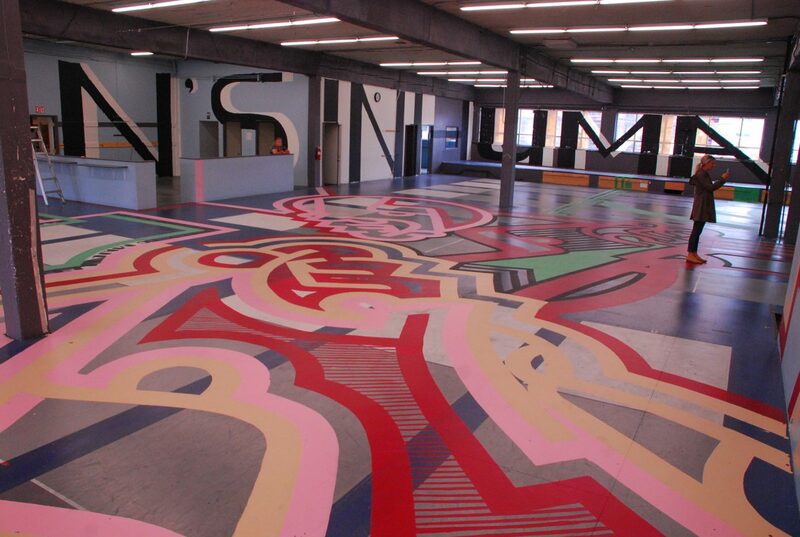 One hundred hours was spent painting the floors and walls of this roughly 40.000 square foot warehouse. 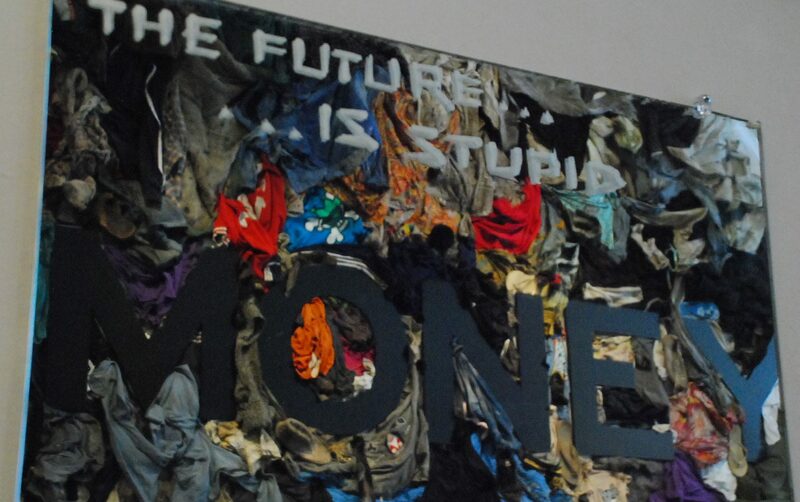 Using donated and salvaged acrylic paint totalling one hundred gallons. 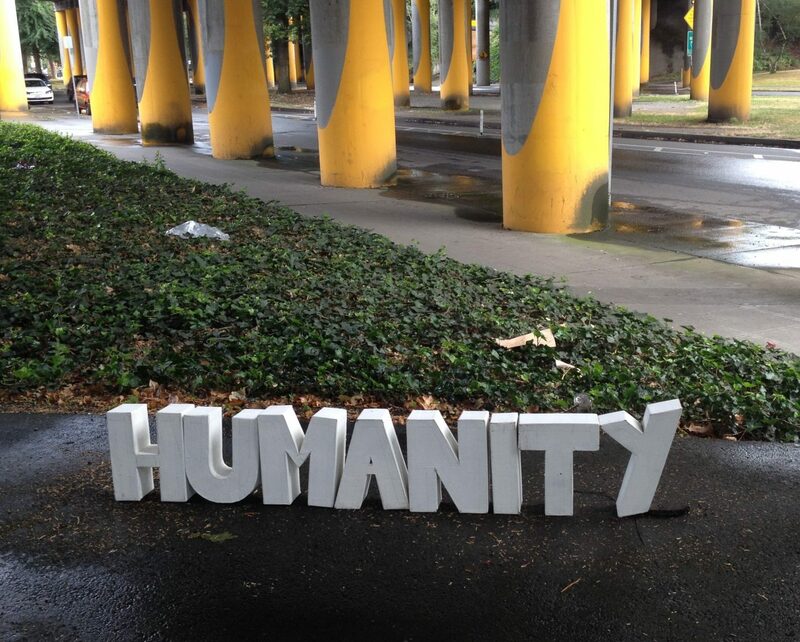 The walls are painted with 20 foot tall letters reading, MAN’S INHUMANITY TO MAN. 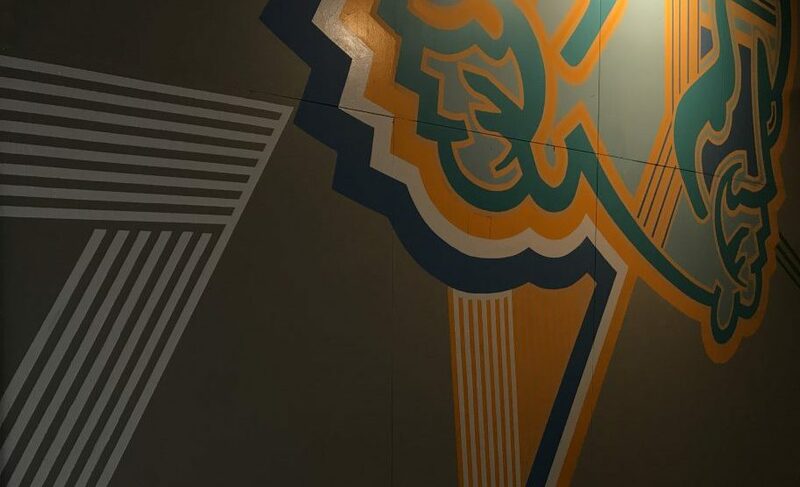 The design on the floor consists of repeated abstract iconography and spatial geometry. In an effort to voice what to some might be viewed as overly idealistic. 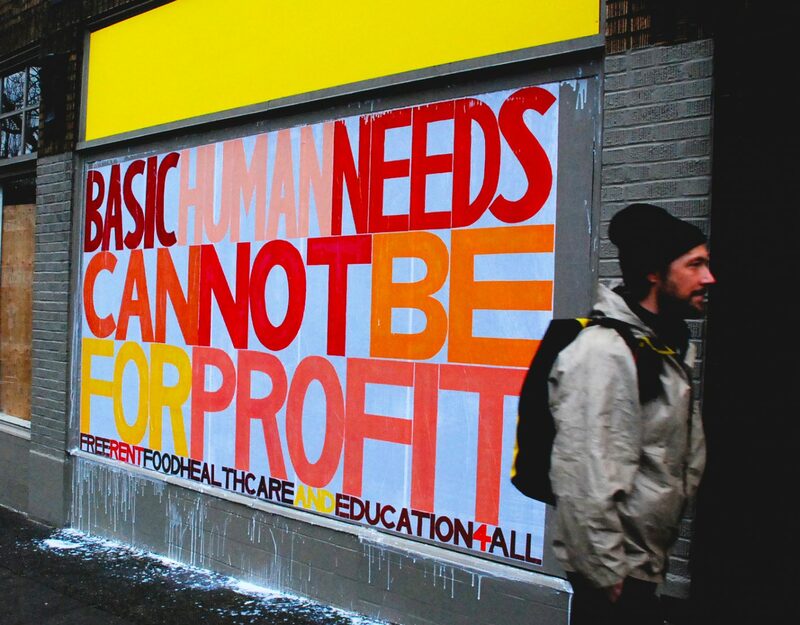 One must press ahead and put actions, thoughts and intentions into public space that support what we all understand as goals that can not be forgotten, let alone actually brought into reality for the survival and betterment of all humanity. 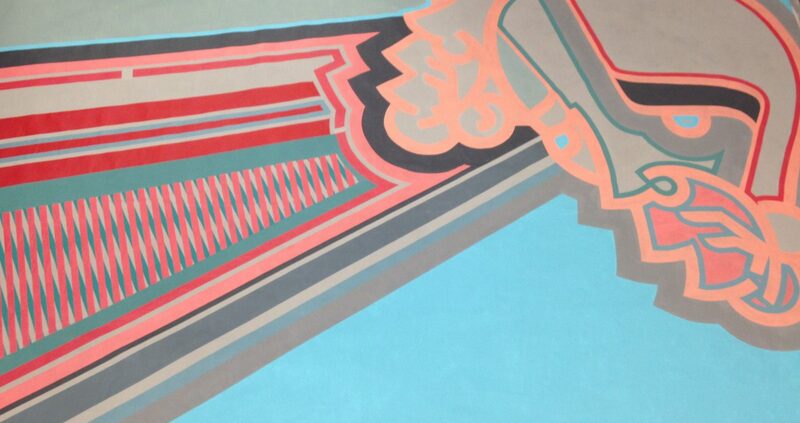 Acrylic paint on paper, dimensions 13’ by 7’. First painted in 2013 as a live painting performance installation for Velocity’s Fall-Kickoff, new additions to this mural in the box office entryway of Velocity dance Center are currently underway. The overall intent is to bring elements of the existing diagonal white lines on the facing of the building into the existing mural. Working with lines and abstracted personal iconography of the human face, color, shape and space are explored. Approximate dimensions 25′ x 15′ painted in acrylic and enamel. Luchador mask created for Urban Artworks 2nd Annual Benefit Auction. Made from the trimmed, hole punched petals of the Monkey Puzzle Tree. 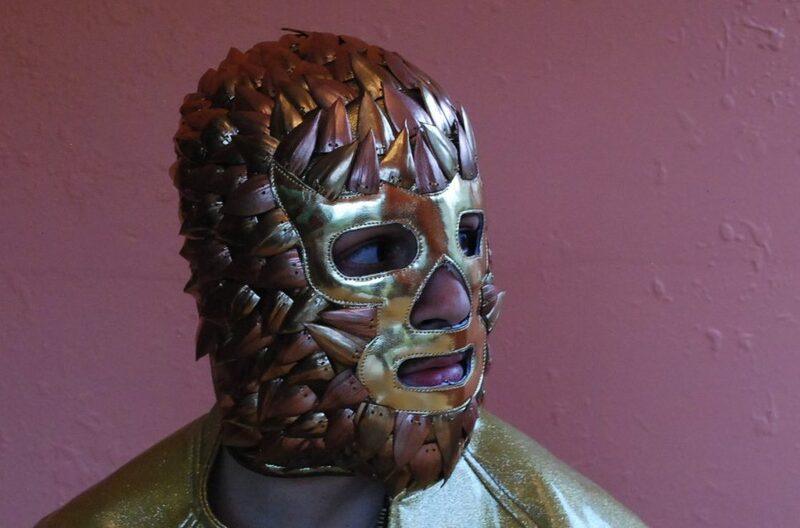 Spray painted chrome gold, brass chrome and hand sewn to create the look of armor. Commissioned mural for On the Boards 16/17 season. 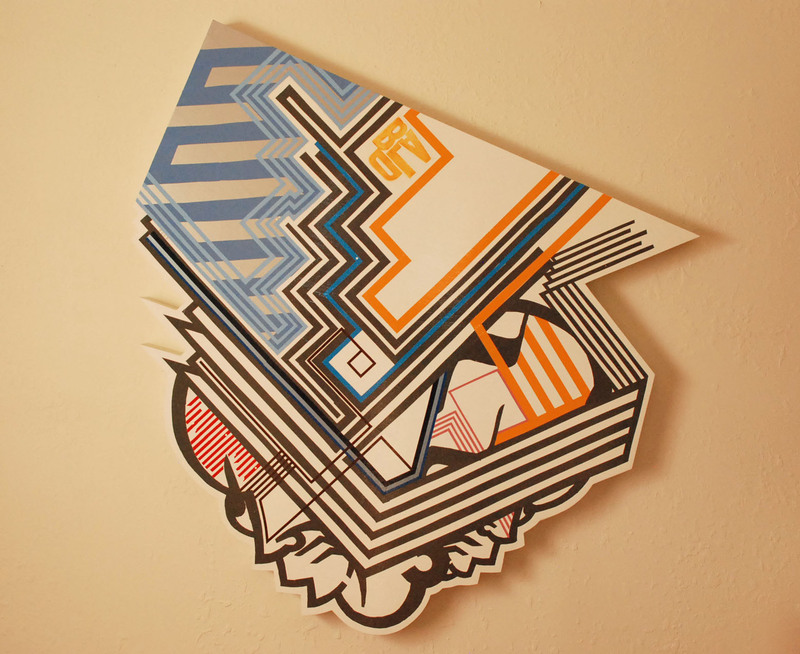 Titled SEE TALK, acrylic paint on banner vinyl, dimensions 20′ by 9′. Lines and personal iconography abstractly convey the conversation and anticipation of an audience pre performance. Spontaneous public installation, Seattle 2016. 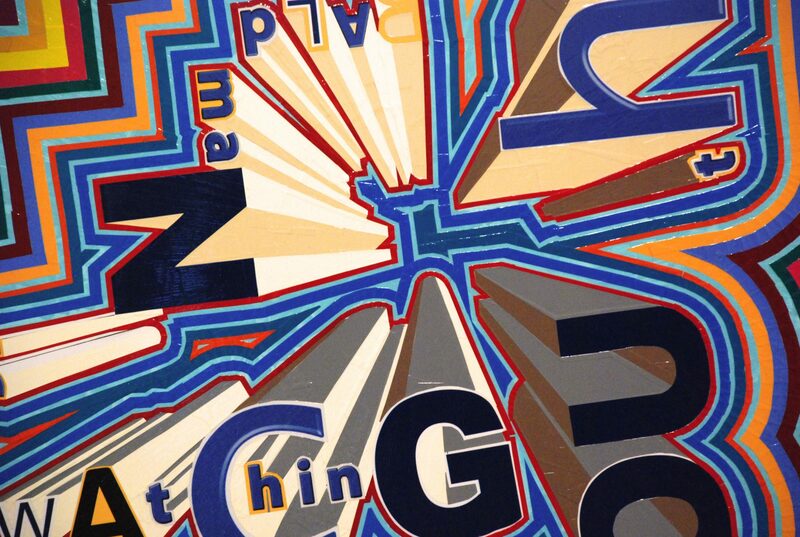 Three dimensional cardboard letters, painted with acrylic paint. Humanity is shown left out in the rain to be reclaimed by nature or possibly a timely passerby.